What sports are you a fan of? At Rakuten AIP, we asked people in the three most populous Asian countries – China, India and Indonesia (combined nearly two thirds of 4.4 billion people in Asia) – as well as Japan for comparison, on what sports they consider themselves a fan of. China and Indonesia shares similar traits of favoring Badminton, Soccer / Football and Swimming. Cricket is a top pick in India, while Baseball and Soccer are favorites in Japan. Soccer is notably among the top 4 in all four countries. Things got interesting when we dug further to see if there’s differences by gender. In China and Indonesia, Soccer was the top pick among Males, while Badminton led among Females. India and Japan showed some changes in ranking of top 5, but overall Cricket retained the top choice in India, and Baseball / Soccer for Japan, regardless of gender. When we tallied up all four countries together, Soccer was the overall top pick among Males, while Badminton came on top for Females. With the FIFA Confederations Cup just finished earlier this month and the World Cup coming up in 2018, we were curious to find out people’s favorite soccer team. 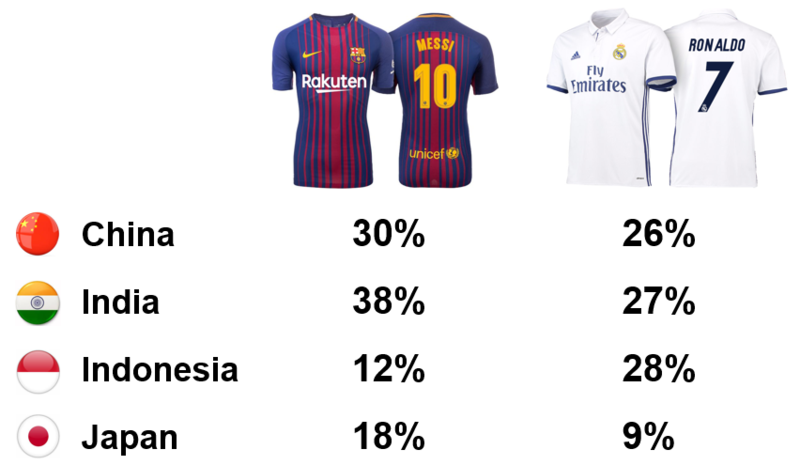 In China, India and Indonesia, soccer fans named those 3 teams in that order, while in Japan, FC Barcelona took the top pick. In Japan, the local soccer team Gamba Osaka came in third ahead of Manchester United. Base: Soccer Fans (China n=181, India n=111, Indonesia n=151, Japan n=86). Excluding national teams. In Japan, local soccer team “Gamba Osaka” came in 3rd with 8%, ahead of Manchester United. Open-end responses coded. There’s no doubt that Lionel Messi of FC Barcelona and Cristiano Ronaldo of Real Madrid rule the fields of soccer. Both superstars are top mentions across the four countries as people’s favorite player. In fact, when combining counts across the four countries, they comprise of roughly half of all mentions, evenly split between the two. When we look at individual countries, we see that Messi leads in China, India and Japan, while Ronaldo has a stronger following in Indonesia. Q. Imagine you had the chance to directly ask one question to your favorite soccer player. Who would you ask, and what would your question be? Base: Soccer Fans (China n=181, India n=111, Indonesia n=151, Japan n=86). Open-end responses coded. What would you ask Messi? We’ve seen how soccer / football is a major sports with fans across Asia. FC Barcelona is considered one of the most favorite teams, with Messi a top favorite player. 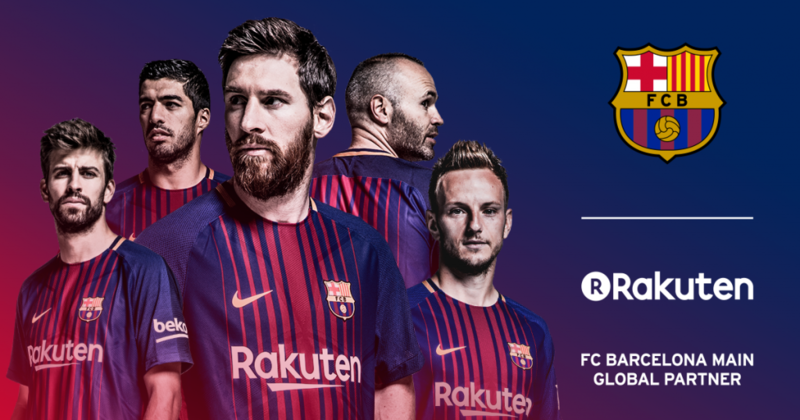 At Rakuten AIP, we’re extremely excited to be part of the Rakuten Group, the new official partner of FC Barcelona!